Lakeside took full advantage of Ipswich’s misfortune as they stormed to a 54-35 win in the first leg of their Knockout Cup tie at Foxhall. The Witches were on the back foot from the outset as star man Danny King suffered a suspected broken arm in a clash with team-mate Michael Haertel in heat one. 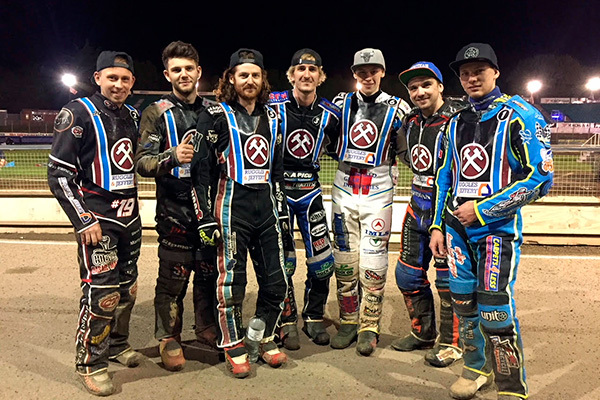 And the Hammers showed no mercy, racing to a convincing win which leaves them in the driving seat ahead of the second leg at the Arena-Essex Raceway on Friday (8pm). It was a perfect response from Will Pottinger’s side after last week’s away defeat at Berwick – and despite having sympathy for their opponents, Pottinger was pleased with his side. Said Pottinger: “Of course, we’re very happy with the result and we’ve given ourselves a great lead to take into the second leg. “If we can’t defend a 19-point lead at home then we certainly deserve to go any further in the Cup competition. “Everybody contributed well points wise. The heat-leaders all got double figures and the rest of the team scored well, so you can’t ask for much more from our point of view. “Everyone pulled their weight which is what you need. You have to feel a bit for Ipswich, because losing your No.1 in the first race to such a big crash was always going to leave them up against it. Richard Lawson struck a faultless paid maximum on his return to the Hammers’ side, whilst Adam Ellis starred against his former club. Nick Morris bagged 10 points with Kyle Newman notching paid nine as the top four powered them to victory with solid support from Ben Morley, Max Clegg and Alfie Bowtell. Cameron Heeps 14+1, Rory Schlein 8, Michael Hartel 6, Connor Mountain 4+1, Danyon Hume 3, Danny King 0, Nico Covatti r/r. Richard Lawson 14+1, Adam Ellis 13+1, Nick Morris 10, Kyle Newman 7+2, Ben Morley 4+1, Alfie Bowtell 3+1, Max Clegg 3. « Hammers return to Foxhall	» Hot Hammers set for bumper support!